Amy Fisher falls in love with Aubrey Piper, a loudmouth and braggart who pretends to be more than the lowly clerk he is. She marries him, over her family’s objections. Aubrey can’t seem to stop insulting others or interfering with their lives. He accidentally sets her inventor brother Joe’s laboratory on fire, wrecks a car, driving it without a license, gets kicked off a radio show for offending the sponsor and blows Joe’s deal with a paint company. I frankly didn’t enjoy The Show-Off until the very end. 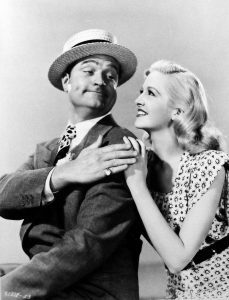 Red Skelton is his normal funny self, but his character of Aubrey Piper is simply obnoxious and hard to like. The ending is contrived, ending with a happy ending all around. The courtroom scene is funny, with Aubrey unwittingly putting his head in the lion’s mouth. This is where Aubrey is served a large enough slice of humble pie to cause his to look at himself. In the process, he becomes a much more likable character. Leon Ames shines as the nice, boring brother in law. He truly does love his wife, and eventually proves it to her – with Aubrey’s help. Amy Fisher Piper (Marilyn Maxwell, The Lemon Drop Kid) – the lovely young lady who is flattered by Aubrey’s attention, falls in love with and marries him – although strife and heartache follow soon afterward. Mrs. Fisher (Marjorie Main, Meet Me in St. Louis), Aubrey’s’ mother-in-law who doesn’t hide her dislike of him. Pop Fisher (George Cleveland, Lassie) – Aubrey’s father-in-law, who doesn’t care for his windbag son-in-law either. Frank Harlin (Leon Ames, Meet Me in St. Louis) – Aubrey’s brother-in-law, a lawyer, and genuinely nice guy. However, his wife doesn’t believe that he truly loves him. Clara Harlin (Jacqueline White, Air Raid Wardens) – Amy’s sister and Frank’s wife, a woman who’s been married for several years, but fears that her husband doesn’t love her. Joe Fisher (Marshall Thompson, It! The Terror from Beyond Space) – Amy’s brother, a young but brilliant inventor, who’s on the verge of selling his invention for a lot of money … until Aubrey interferes.